Jenny Bean's Pin Tuffet [H1167] - $6.00 : Yarn Tree, Your wholesale source for cross stitch supplies. Cross stitch pattern by Shakespeare's Peddler. Look at this adorable pin tuffet! 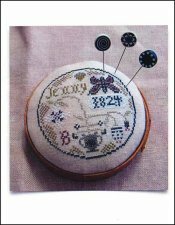 A pot of blooming flowers is stitched in the middle with "Jenny," "1824" and a butterfly stitched above. Stitch count is 60 x 60.